The Incredible Tiles 2048 iOS Game is an amazing game with simplicity and classic rules with new innovative design and huge amount of new features! 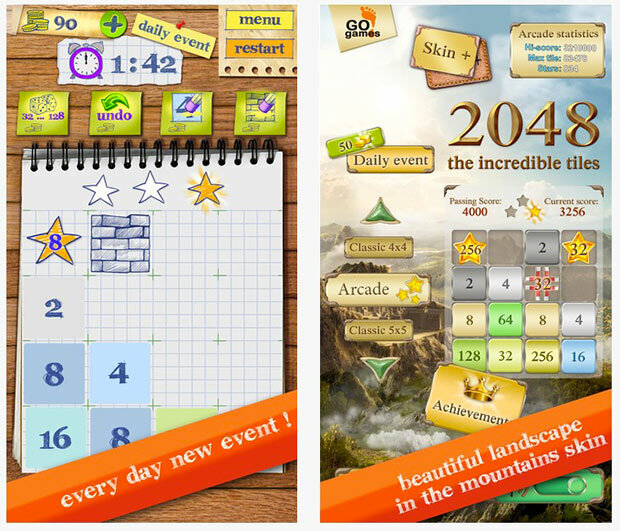 The Incredible Tiles 2048 games developed by GO GAMES LTD. is one of the most popular and addictive puzzle games. This is the modified and upgraded version of the traditional 2048 game. This is an amazing game which has conquered many hearts. You will probably love playing this game if like playing simple yet exciting games where you have to make use of your reflexes while deciding your next move in the game. The smooth gameplay and excellent design will surely make you addictive to the game. The Incredible Tiles 2048 game comes with several new kinds of cells such as spring, multiplying, teleportation, enlarger, bricks that makes the game even more interesting and challenging. The responsive and smooth gameplay of the game ensures that everything works perfectly well and the user does not face any difficulty regarding the functionality of the game. In order to move the tiles you have to swipe the tiles right, left, up or down. Remember once you bring two identical numbers tiles together they will merge to form a new tile displaying the sum of both the numbers. You might be aware of the fact that with every swipe of a tile, a new tile appears on the board that makes the game even trickier as you have to prevent the board from flooding. Your ultimate aim is to make a tile numbered 2048. The Incredible 2048 Tiles game comes with certain new features as compared to the traditional 2048 game. Let us now explore some of the features of this game. The classic 2048 game stops the player when he reaches a sum of 2048 on a tile. However, The Incredible Tiles 2048 comes with some additional features blocks that randomly appears like enlargers (increase the current numbers), teleportation (move the number to a tile that is selected by the player), springs (take the number to the bottom row), dividing (divides the number), bricks (prevents the player from moving a number to a particular tile), multiplying (multiplies the number). 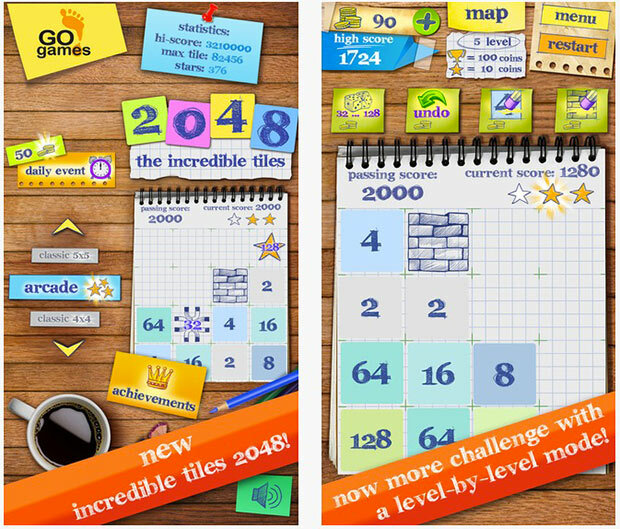 The Incredible Tiles 2048 game offers different power- ups that assist the player in reaching the goal quite easily. Therefore, with the help of the buttons positioned in the upper toolbar the player can roll a dice, erase bricks, undo the last move, erase a tile. This offers the player with great opportunity to increase the value up to 6X of the current tile. In addition, the player can even replace the tiles, stop them from appearing or clear the field altogether. This game features an improved design as compared to the classic 2048 game. The game features eye- catching graphics and animations and offers numerous fascinating additions like various game modes, levels, power- ups etc. The Incredible 2048 Tiles game in inclusive of a special feature i.e. the player is rewarded with coins on the completion of a level. These coins can be used to get power- ups that can be used in difficult situations. The notebook style of the game is more engaging in comparison to the traditional 2048 4X4 grid style. This makes the game more usable. The app can work equally well with old iOS devices due to its minimum requirements. It can work with iOS 4.3 and above. It is compatible with all Apple devices like iPod, iPhone and iPad. The game is of 40.2 MB and can be easily downloaded from App Store without incurring any additional cost. The Incredible Tiles 2048 has got an engaging gameplay that makes the user addictive to it. Puzzle game lovers would definitely love this game. Though the game is a modified version of traditional 2048 game but still it offers certain new features like different game modes and power- ups that are worth giving a try. In addition, the game can be downloaded without paying a single penny so there is no harm in trying the game for once. So, download today and get ready for an unforgettable experience.